Music plays an important part of the life of the Chapel. Please join us to enjoy the glorious sound of the choir and organ, and experience how it enhances our worship. In addition to sung services there are regular concerts to which all are welcome. Further details can be found in What’s On or by downloading the Chapel calendar. Details of Services in the current term can also be downloaded. The current choir consists of nine professional singers who provide music of the very highest quality for most of the services in the Chapel, as well as appearing at the Inn for other musical events from Bach to Bernstein. 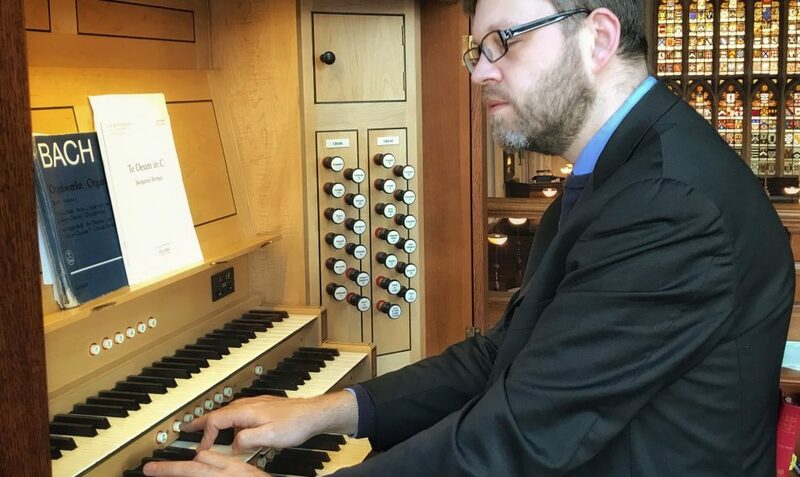 Nicholas Shaw is Organist and Director of Chapel Music. In October 2009, the installation of a new organ by Kenneth Tickell, the English organ builder, added a big attraction of the Chapel. The organ is a forty stop instrument. More information is available to download from this page. The Chapel Concert in 2019 is on 5 June at 6.00 pm, followed by a reception (booking required) in the Old Hall. Details will be published in the Easter and Trinity Chapel Calendar. A series of lunchtime concerts, organised in collaboration with the Royal College of Music, take place on the last Tuesday of each month during term time. Admission is free. Details of all concerts may be obtained by contacting the Chapel Clerk, Gregory Tyler: gregory.tyler@lincolnsinn.org.uk.